Every woman dreams about having a perfect body. In this way they can feel confident and attractive. Weight loss is also a great way to get rid of inhibitions and feel comfortable in society. That’s why today, there are so many people who do their best to get a slim, strong, and attractive body. All of them have problem areas that they would like to reduce. Fortunately, there are many methods that can be really helpful in this case. Today we are going to talk about such problem as muffin top and how to get rid of it. There are thousands of women who suffer from this issue and want to reduce it. However, it is not an easy task, and many people just give up. You should remember that there is nothing impossible. There are things that are really helpful in this situation. Healthy diet and right exercises work wonders. Just choose what is suitable exactly for your problems. You should quit junk food and replace it with healthy foods that will provide your body with all necessary nutrients. In this way you’ll be able to get rid of excess weight, gain muscle mass, and stay healthy and energized. 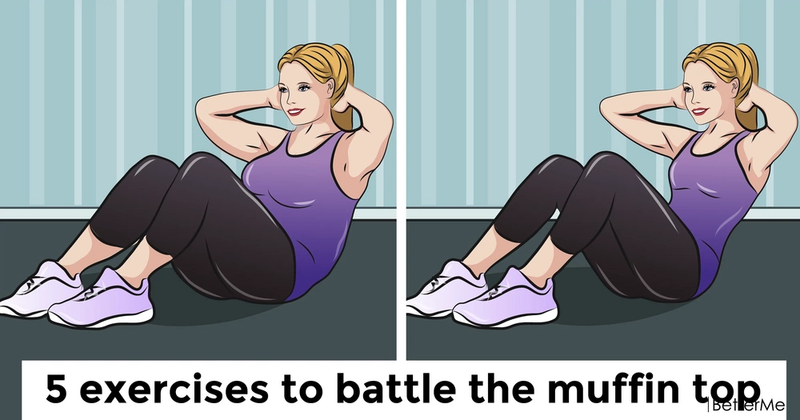 Today we have prepared for you 5 exercises to battle the muffin top. They are simple and effective, so you’ll see the first results very soon. By performing these exercises on a regular basis you’ll get a flat belly in a short period of time. So try our moves and you won’t regret it!